ACM SIGCOMM China, approved by ACM China Council and ACM SIGCOMM on May 13th, 2016, is the official organization of ACM SIGCOMM in China. ACM SIGCOMM China is a community for Chinese researchers who are interested in network research, network standards, network history, and the educational aspects of networking. ACM SIGCOMM China aims at establishing a connection between SIGCOMM and Chinese researchers, enhancing the research in the field of data communication around China, and bringing the high-quality activities of SIGCOMM to Chinese researchers. Submissions should be double-blind and up to 6 pages in length (including everything) using two-column, 10-point format, and should use the required LaTex template to ensure compliance. 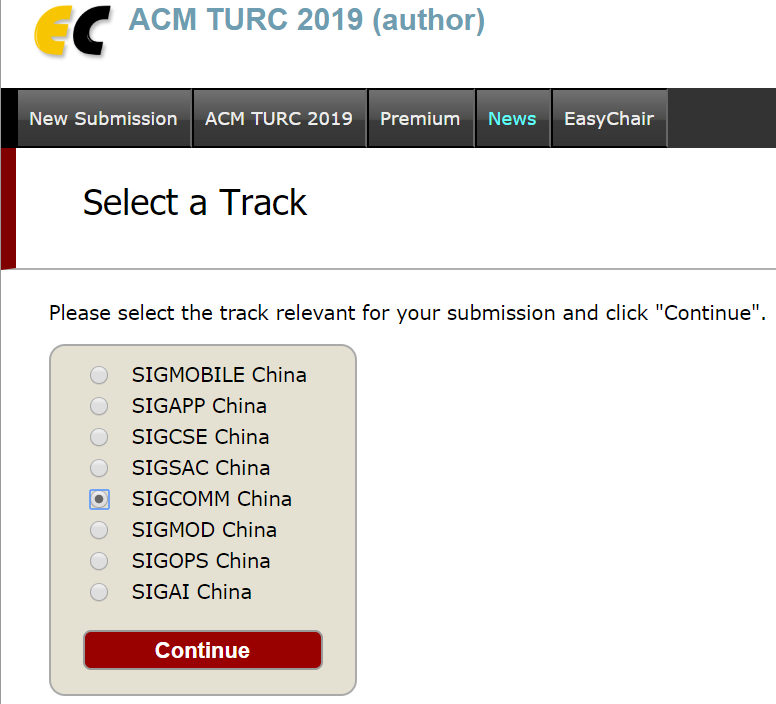 The submission page is https://easychair.org/conferences/?conf=acmturc2019 (please be sure to select the SIGCOMM China track as illustrated below). Detailed submission instructions can be found in the appendix. All accepted papers will be published on ACM Digital Library. One or more papers will be selected to receive the Best Paper Award and/or Best Student Paper Award. Also, authors of selected papers have the opportunity to submit revised and expanded version of their papers to the special issues of well-known SCI journals such as Concurrency and Computation: Practice and Experience, Tsinghua Science and Technology, etc. The SIGCOMM China symposium seeks papers describing significant research contributions to the field of computer and data communication networks. Paper submissions should report important results substantiated by experimentation, simulation, or analysis. Ethics considerations: the conference’s ethics expectations. 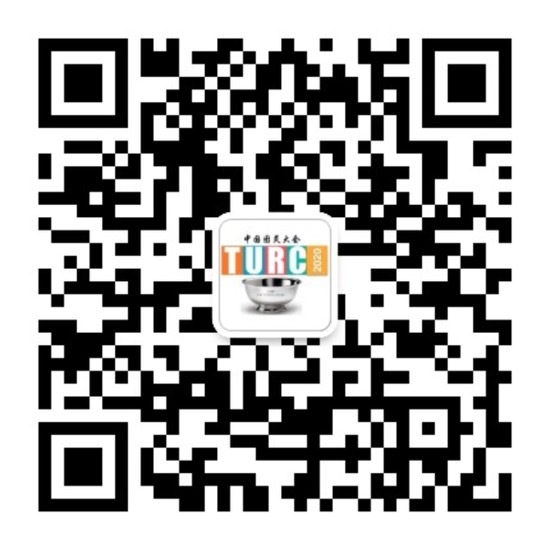 Paper registration: what to register, and how to determine TPC conflicts. Paper novelty: what is eligible to be submitted. Paper anonymity: how to prepare for anonymous submission. Paper formatting: how to format your paper, including LaTeX and Word templates. Paper acceptance: what to expect if your paper is accepted. Authors must as part of the submission process attest that their work complies with all applicable ethical standards of their home institution(s), including, but not limited to privacy policies and policies on experiments involving humans. The PC takes a broad view of what constitutes an ethical concern, and authors agree to be available at any time during the review process to rapidly respond to queries from the PC chairs regarding ethical standards. Registration only requires submission of paper metadata: paper title and abstract, author names, affiliations, contact email addresses, topics matching the subject matter of the paper, track (experience or main), and conflicts with PC members. The paper itself does not need to be submitted at the registration deadline. However, the paper title and abstract submitted during registration must be complete - not placeholders - and correctly characterize the paper that will be submitted. Authors can change the wording of their titles and abstracts for submission, but their essence should not fundamentally change. The PC will use the information provided during registration as a basis for making review assignments. 1. You are currently employed at the same institution, have been previously employed at the same institution within the last 12 months, or are going to begin employment at the same institution. Past or present association as thesis advisor or advisee. Collaboration on a project, publication, or grant proposal within the past 2 years (i.e., 2016 or later). If there is no basis for PC conflicts provided by authors, those conflicts will be removed. In particular, do not improperly identify PC members as a conflict in an attempt to avoid having an individual review your paper. Under no circumstances should authors submit previously published work, submit the same work simultaneously to multiple venues, or submit papers that plagiarize the work of other authors. Like other conferences and journals, we prohibit these practices and may take action against authors who have engaged in them. In some cases, the program committee may share information about submitted papers with other conference chairs and journal editors to ensure the integrity of papers under consideration. If the PC discovers a violation of these principles, sanctions may include, but are not limited to, contacting the institutions of the authors and publicizing the details of the case. Papers accompanied by nondisclosure agreement requests will not be considered for publication, nor ever disclosed. Before final submission, you are expected to make sure that your paper complies with these requirements. Authors are strongly discouraged from violating the formatting requirements with the aim of including additional material: submissions that violate the formatting requirements may not be reviewed. Submit papers of up to 6 double-column, single-spaced pages, including figures, tables, appendices, and references. Submitted papers should be written in English. Submit papers using a 10pt font on 12pt leading formatted for printing on Letter-sized (8.5" by 11") paper. Paper text blocks must follow ACM guidelines: double-column, with each column 9.25" by 3.33", 0.33" space between columns. Each column must contain no more than 55 lines of text. For submission, use the required LaTeX template to ensure compliance. Please do NOT use copies of these templates that you might find elsewhere since we cannot be sure that those are compliant. Note that the final copy will be 6 pages using the ACM standard 10pt format. This style may result in more text than your submission so that you can adequately address reviewers’ comments. List the submission number and the number of pages in your paper in the author block, e.g., "Paper #N, 6 pages", beneath your title. Register your title, abstract, etc., will provide a paper submission number. Per the anonymity guidelines, remember to remove any author names. Submit papers in PDF (Portable Document Format) and ensure that they are compatible with Adobe Acrobat (English version). Other formats, including Postscript, will not be accepted. Avoid using non-standard fonts. The PC must be able to display and print your submission exactly as we receive it using only standard tools and printers, so we strongly suggest that you use only standard fonts that are embedded in the PDF file. Limit the file size to less than 15 MB. Contact the PC chairs if you have a file larger than 15 MB. The PC will notify authors of acceptance/rejection decisions by March 20th, 2019. Authors of accepted papers should immediately take actions addressing comments raised by the reviewers and the PC meeting after notification. Some papers may be shepherded by members of the PC. After acceptance, substantive changes to paper titles require approval by the PC chairs. Only in exceptional circumstances should authors change their author list, and only with the approval of the PC chairs. Authors of accepted papers will also need to sign an ACM copyright release form. Electronic copies of the camera-ready papers will be published on the conference Web site before the conference, unless authors specifically request otherwise. All rejected papers will be treated as permanently confidential.